The regular loco-hauled services on the Cambrian in the 1970s were the summer-Saturday services between Aberystwyth and London Euston. On a grey August day in 1975, 24075 and 24076 are seen at Welshpool on the 10:07 Aberystwyth-Euston. They had worked down on the 04:15 Shrewsbury-Aberystwyth mail, and would work this train as far as Shrewsbury. 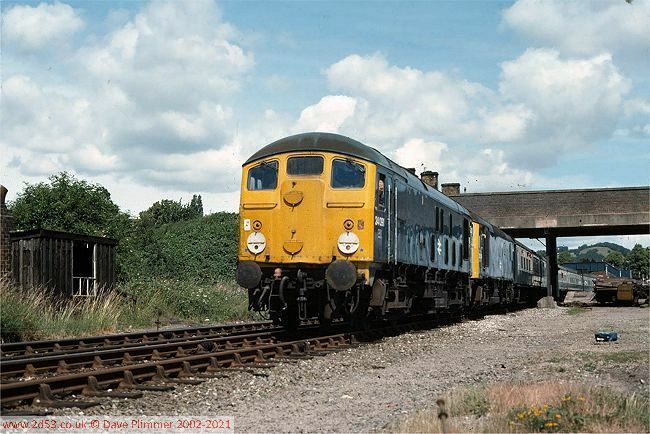 1975 was the last year that Class 24s regularly worked these trains - Class 25s becoming the regular motive power instead. 24076 was withdrawn within 2 months, and 24075 followed by the following January. 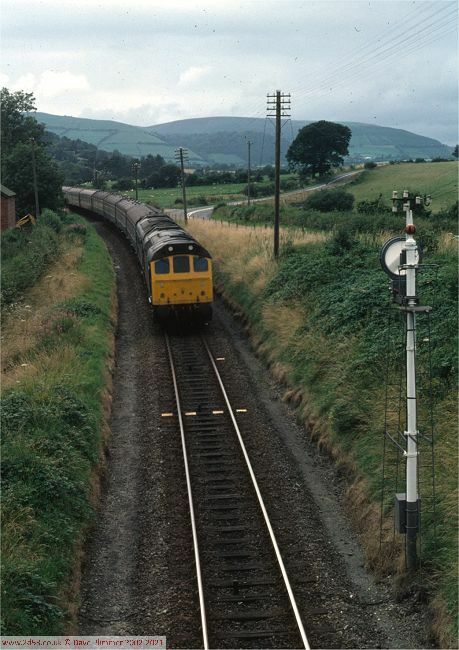 But some Class 24s remained in service, and almost 2 years later, 24091 is seen at Welshpool on the working in the opposite direction, 1J24 09:30 Euston-Aberystwyth on the 16th July 1977. Its partner was 25156. 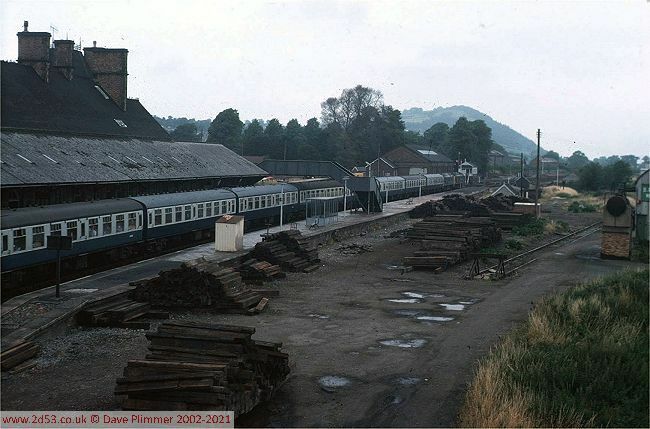 Both trains are seen calling at the original station - the platforms have since been relocated to the right away from the main building, to make way for the Welshpool bypass. There were also loco-hauled trains on Sundays, which ran either to Barmouth or Aberystwyth. 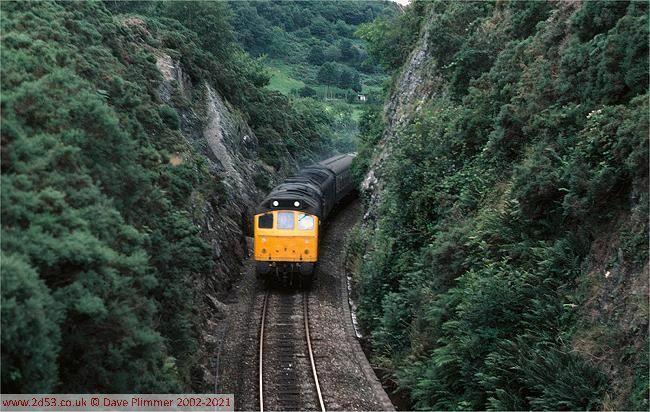 On 10th August 1980, 25194 and 25053 are seen in the cutting at Commins Coch on the 18:00 Aberystwyth-Euston. The locos are on the climb up Talerddig bank, and both engines are working hard with 12 mark I coaches to haul. In fact, it was such slow progress that it was possible to beat the train over the top, and it is seen again on the approach to Carno. The banner repeater is for the signalled level crossing there. In the summer months, loco and coaches would occasionally appear on the DMU diagrams, as seen here with 25183 working 2J57 11:40 Shrewsbury-Aberystwyth on the 29th July 1976. 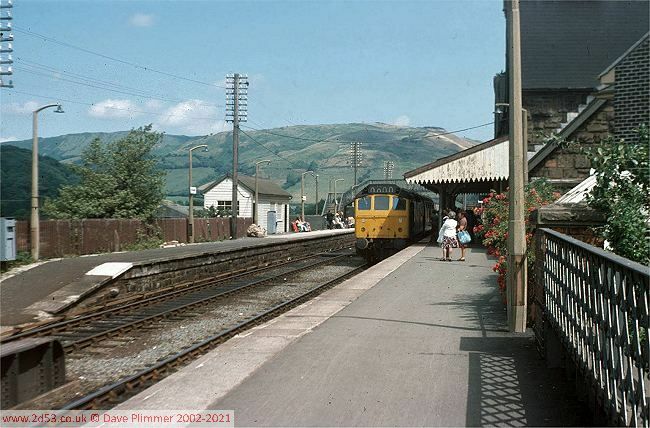 Machynlleth looks the typical country station in this scene, but beyond lay the depot where the DMUs working the Cambrian lines were serviced. Remarkably, not only does this still survive, it has been expanded, maintaining the entire ATW class 158 fleet. The end of an era at Machynlleth. 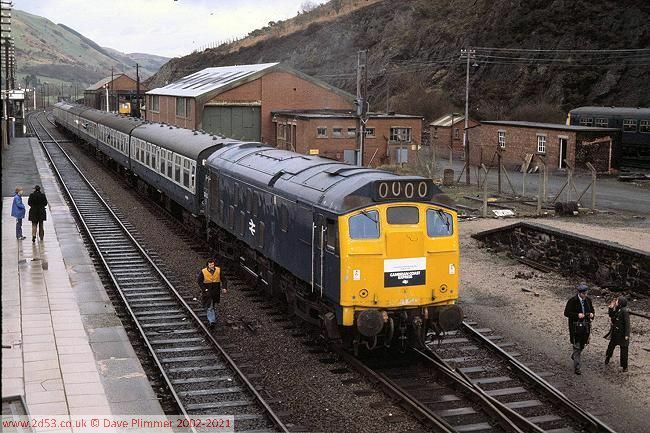 On the 28th January 1978, a special train ran along the Cambrian lines as a Class 24 farewell. Although the last Class 24 actually survived for another two-and-a-half years, it was the end of the class on the Cambrian. Another "final" event, was the splitting of the train at Machynlleth, with portions working to Aberystwyth and Barmouth, as the real Cambrian Coast Express had done in the age of steam. 24133 is seen with the 6 coach Barmouth section, 24087 and 25165 having already left for Aberystwyth with the other half of the train. In the background is the diesel depot, with Metro Cammell, Park Royal and BR Swindon "Cross-Country" units present.